We sell many styles of custom and stock style headlights for Honda Yamaha Kawasaki and Suzuki motorcycles. Also headlight parts and accessories like headlight ears, replacement bulbs, and visors for your bobber, cafe, chopper or custom motorcycle. Scroll down to see our selection. 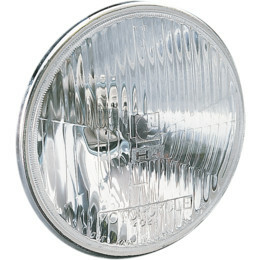 Light uses a 7 inch sealbeam or H4 Halogen unit sold seperatly below. Universal style pictured top, OE style (bottom Pic) comes with large oval holes to mount factory rubbers found on early Kaws. 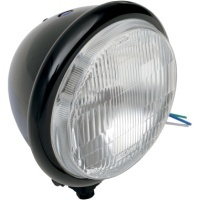 Beautiful flat face quarts headlight globe that utilizes standard P43T base H4 halogen replaceable bulb. Fits lights above and most early model Japanese bikes. Kits contain all three rings and hardware to mount rings. This headlight is basically a replica of the '82-'83 VF750C Magna Headlight. It was also found on bikes such as VT750 Shadow '83, and the CB1000C. It has 10mm mounting holes and is made of all steel with a beautiful chrome finish. 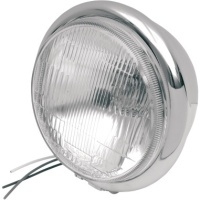 Works great with our chrome universal headlight ears and aluminum mini signals. Fits many bikes as a replacement if the old light is missing or after you remove a touring fairing. 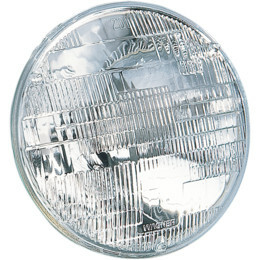 Has removable type H4 Halogen bulb so you never need to find a hard to get sealed beam. Sold complete as seen with new bulb. 10mm threaded holes for mounting. Universal Square headlight assembly with Hi Low, replaceable bulb. 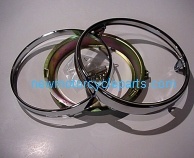 Has a chrome ring assy and a unpainted molded black plastic shell. Mounting holes are appr 7 inches apart with rubber inserts and the light dimensions are appr 7 1/2 inch by 5 inch and the larger part is about 3 1/2 inches deep tapering into a smaller section that is appr 3 1/2 x 4 inches and has a continued depth of 1 3/4 inches with a total depth of 5 1/4 inches. The bulb is dual element and is 35 watts. Comes exactly as shown. Replace stock headlight ears on most bikes with these universal ears. Fits forks from 32mm to 40mm. Chrome plated steel or Black painted steel.